Thought I would post some progress and document the build process on my new H18 that I am assembling. 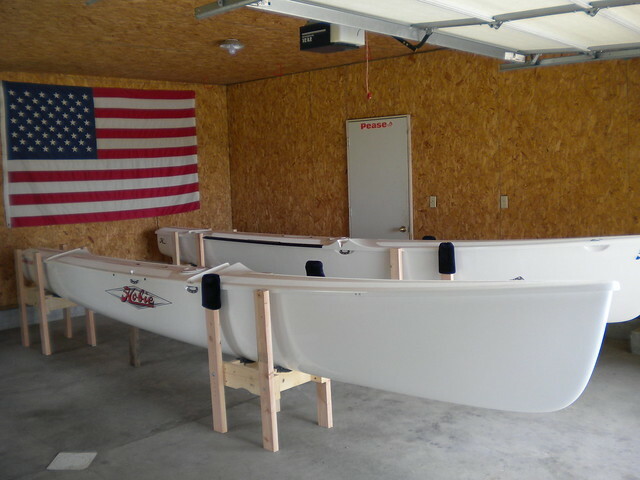 I am one of the folks that took delivery of new H18 hulls late last summer. We also ordered the additional stuff to put a new H18 together...likely one of the first new ones in nearly a decade...and also likely one of the last. 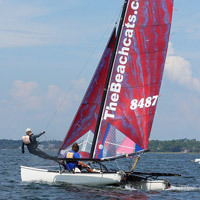 The Hobie 18 is a great beach cat...I have owned my fair share of Hobies but really enjoy the 18 for the durability, versatility, and comfort. The padding are golf club covers, and positioned so that if the hulls rock while working with them they'll not contact the wooden legs of the cradles repeatedly. First job to tackle are the tramp tracks...these were factory riveted on by Hobie with no backing washers...recalling stories of folks who have had tramp tracks pull out under sail, and because it seems that it would impact the longevity and stiffness of the catamaran, I have opted to re-rivet these with a proper backing washer to help spread the load of the rivet out to the hull lip & keep them from loosening up. 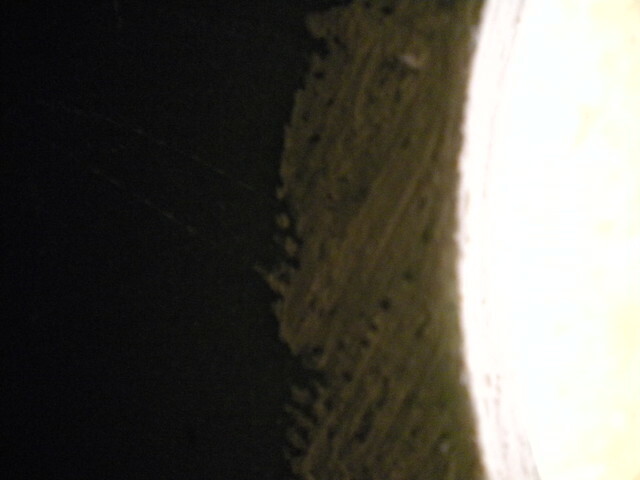 The next photo shows the pencil pointing at a removed rivet from these hulls. Quite a fairly small shoulder to transmit the loads across. 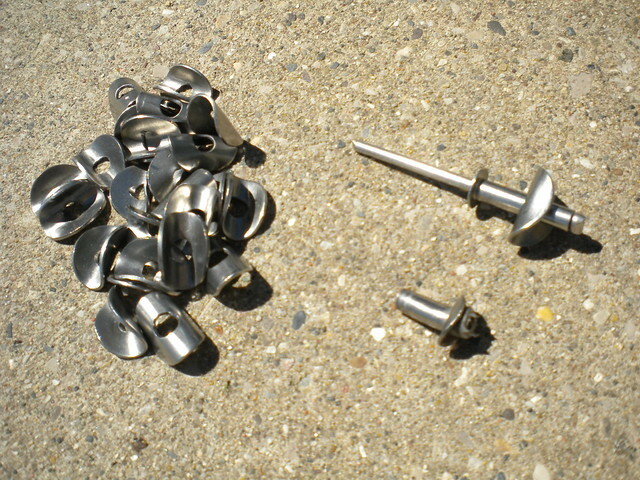 To the right is a standard rivet removed from an older Hobie 18 track, with a factory Hobie stainless backing washer. 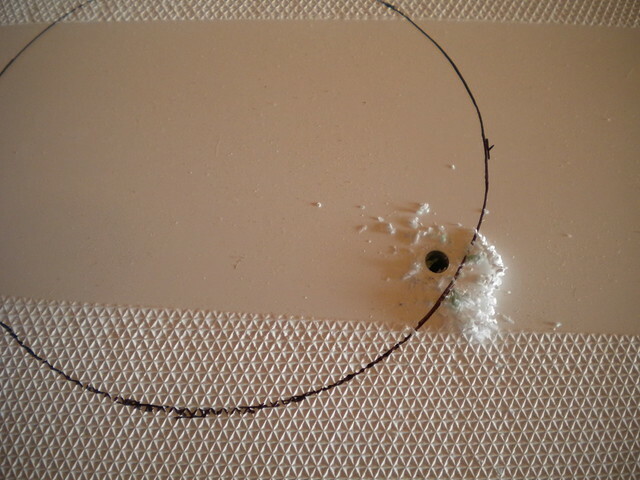 Farthest to the left is an example of the backing washers that I am using, which have even more surface area. 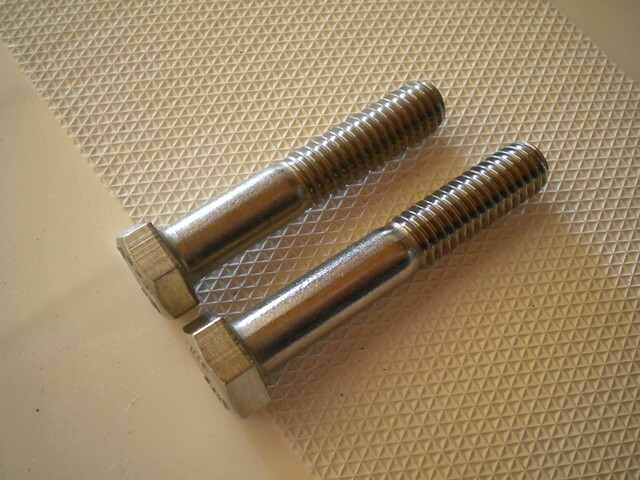 This example was removed because the rivet did not set correctly. Here is a trick when setting rivets inside the traveller tracks, or any tight clearance area. 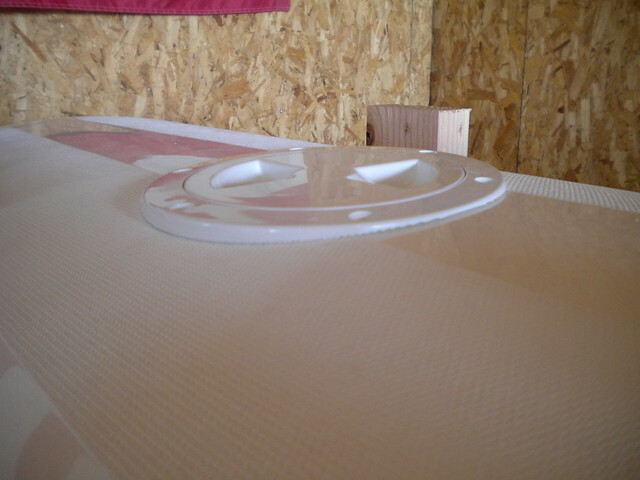 Create a short stack of washers / nuts (I used one washer on the bottom and two small nuts as shown) to create a clear space for the nose of your rivet gun, so you don't inadverdently pinch or dent the traveller track. This is great. I will be watching for your posts with anticipation. I assume you plan to use all available new OE parts? I see you are doing the rear ports - are there any other mods you plan to make or are you sticking to the original design? Well done, great pictures, and an exciting new chapter in your (sailing) life. 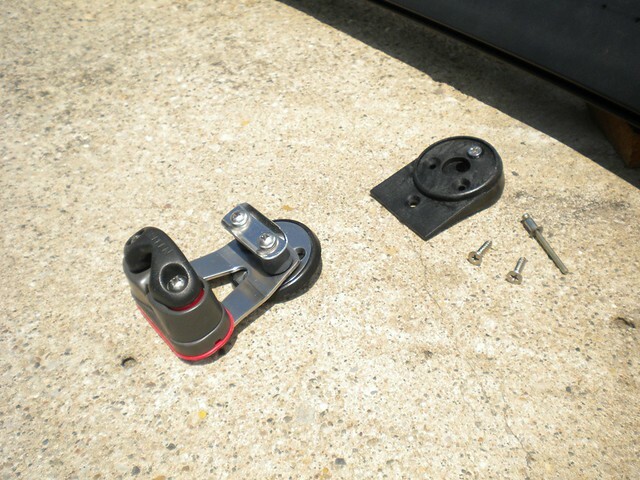 Now I understand how difficult it is to mount a tramp rail....something I needed to do on my 1988 SE. 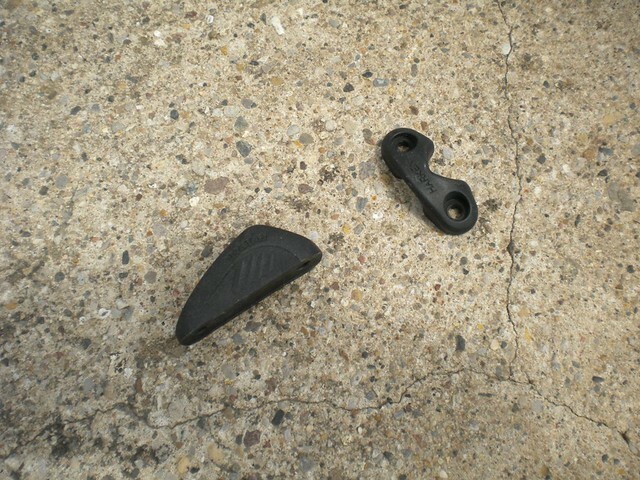 Please also include that section about rudders and castings, with your new 'lining up' method. 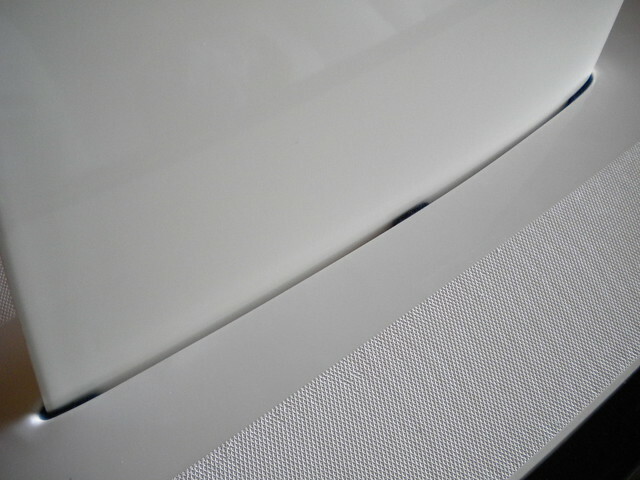 And more on creating the rear ports, with pictures, when it happens. Bungee on the mast rotator line? I plan to do all the usual upgrades, so it should be nice when done. 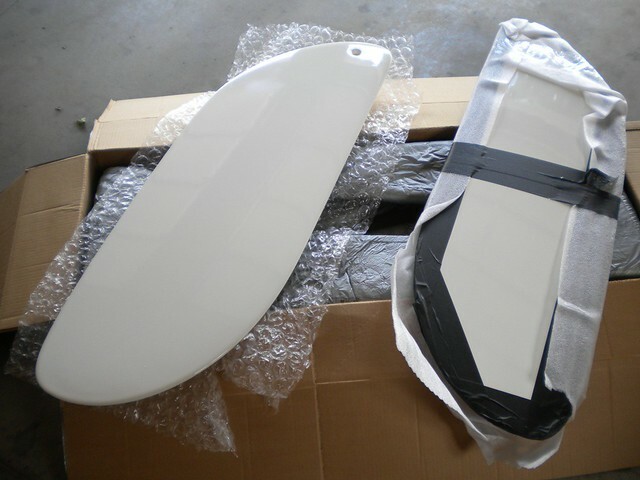 The SX wings will essentially be the only used parts in the project, but I have been saving a really sweet set for a while that are like new, so they should be fine, and I am using all new mounting hardware so I will be able to fit them to the boat as a new set would be. Sails are custom-colors factory Hobie, seemed like the right thing to do. 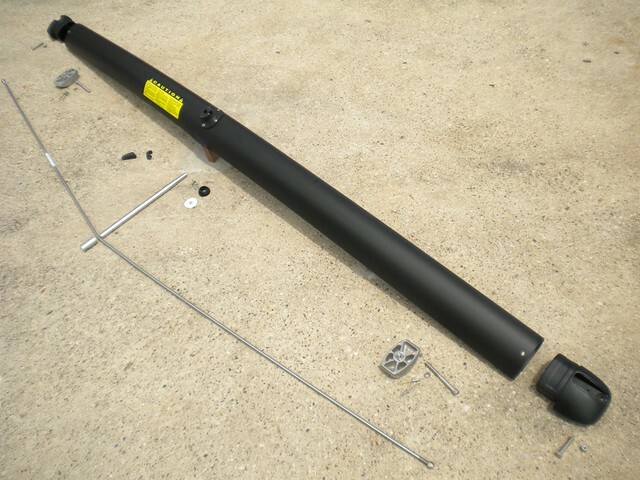 I'll have two masts, a brand new comp-tip for racing if I ever get the chance, plus an old-school all-aluminum older matching black anodized mast for every-day use. I really like the way the solid masts sail, plus they seem a bit lighter..? What a great thread, thanks for putting this together as well as all the great photos. I can't wait to see this brand new 18 completed. Good luck! 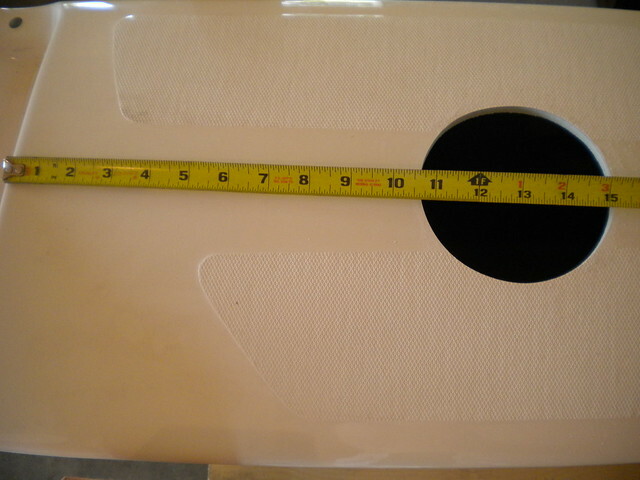 The Hobie instructions indicate port placement of 10 inches or more from the crossbar locations. I ended up being just slightly over that amount. 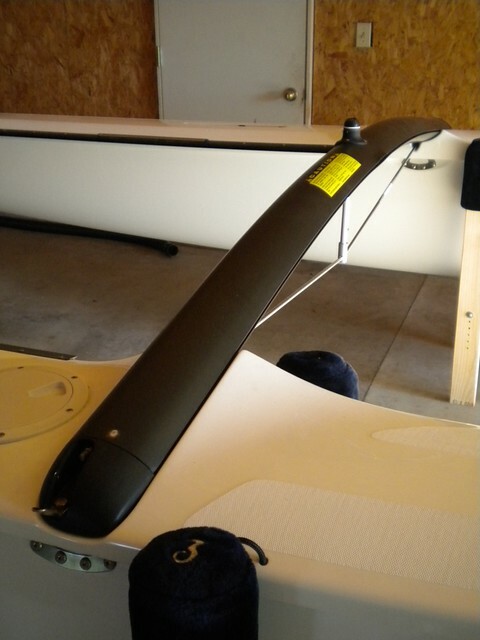 Here is a pic of locating a port, with the idea of being able to comfortably access both the transom in the future if needed, as well as the inside of the crossbar saddle for the anchor plate installation I am planning. Holes marked. No turning back! 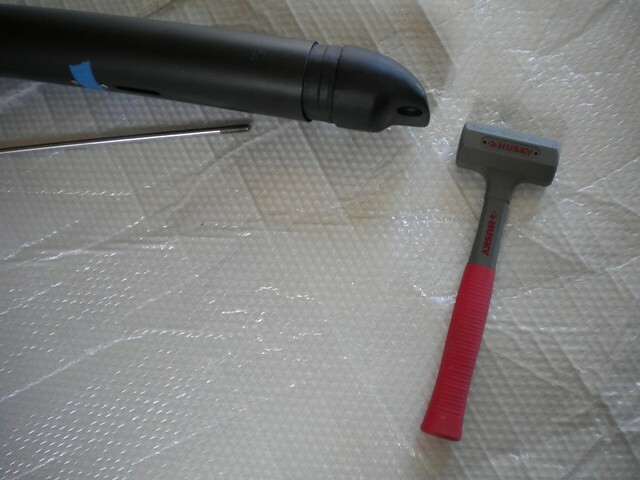 Cutting tool of choice. Works great. Practice inside your circle before attempting on your own, though. 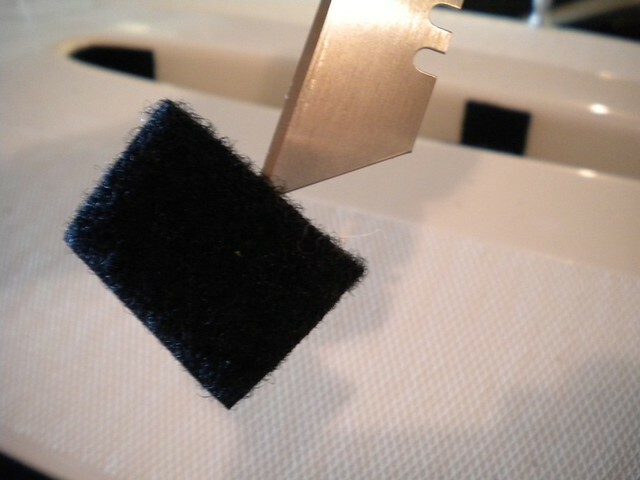 You want to cut in such a way that if the bit wanders, it wants to wander to the inside. 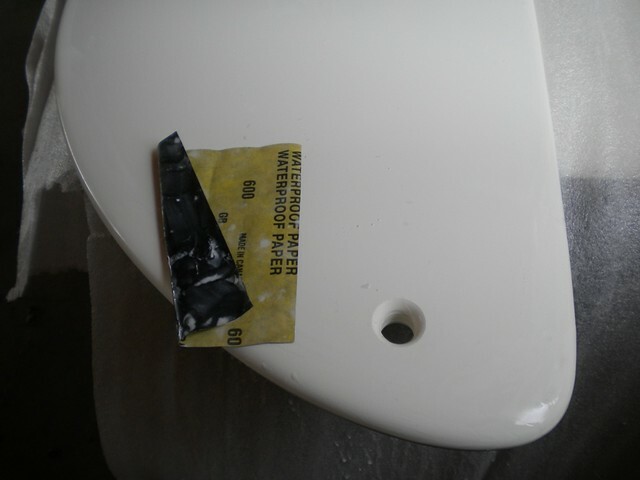 Also remember to cut perpindicular to the horizon (not to the hull deck) since that is how the hatch covers are molded (side walls of the hatch ring are perpindicular to the hatch cover top). 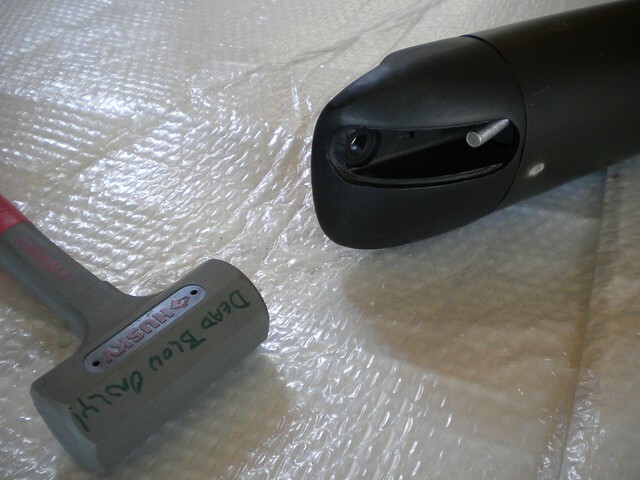 It is almost a two person job to do the cutouts...one person to do the cutting and another to hold a shop vac nozzle close by to remove debris as you go (so you can see your line). 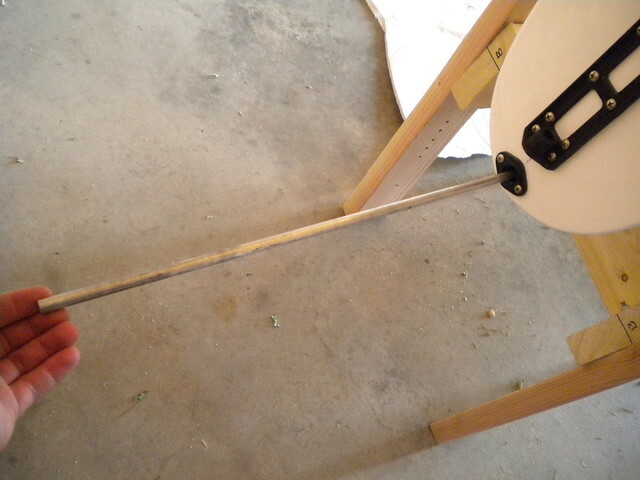 I used a large spindle sander drum to clean up the cut edges nice (by hand, not in a power tool). Very little cleanup needed, though. Trial fitting. Very very nice contour. 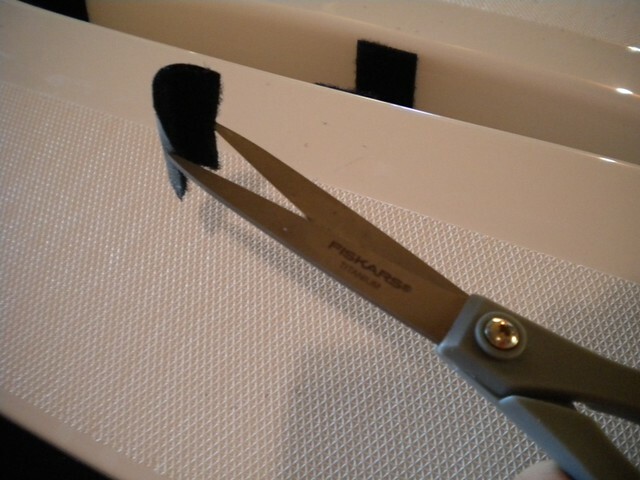 The next step for me was to remove a sliver of foam from the inside edges, all the way around. 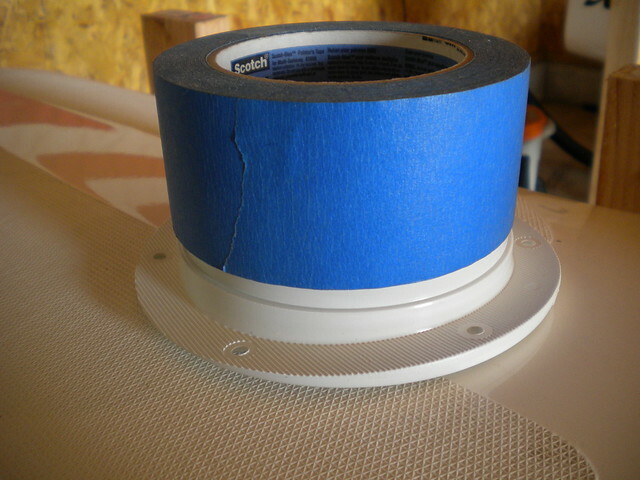 I am sealing these edges against future water intrusion and damage to the foam core. 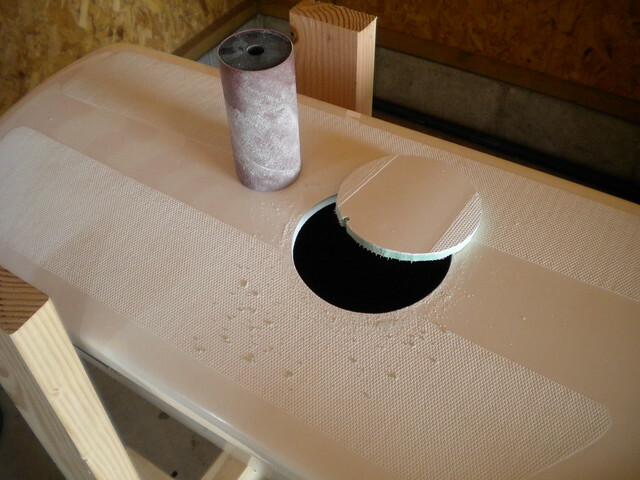 Total depth of removed foam just over 1/8"
In addition, using my finger and the leftover resin, I smudged a ring around the bottom edge of the holes on the inside, just to tie up & seal any fractured glass fibers on the inner layer of fiberglass. 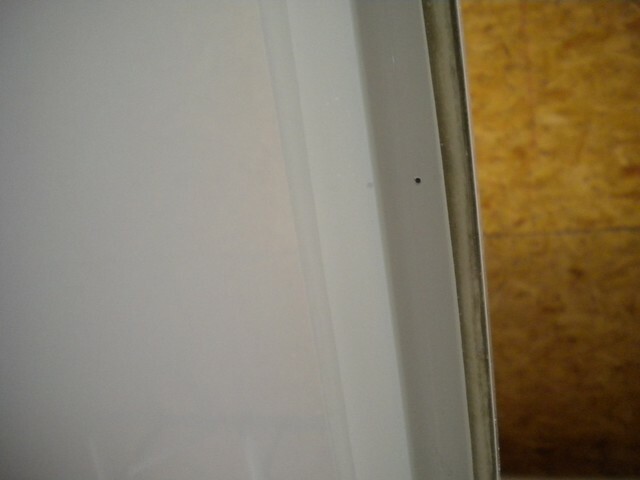 The inner glass layer is much thinner than the outer. Might have went a little overkill here (only the outer 1/4" would have sufficed) but it will last. 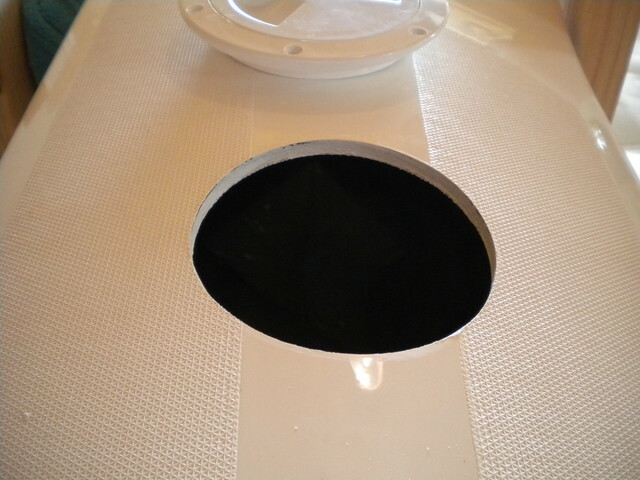 Along the same line of thinking, I plan to 'bed' the hatch covers in with silicone alone, without using the nylon fasteners. 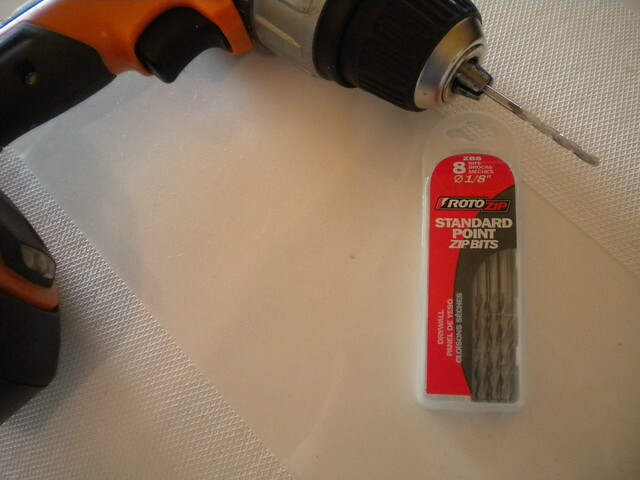 This will eliminate drilling holes through the foam core. Here they are, ready to go. 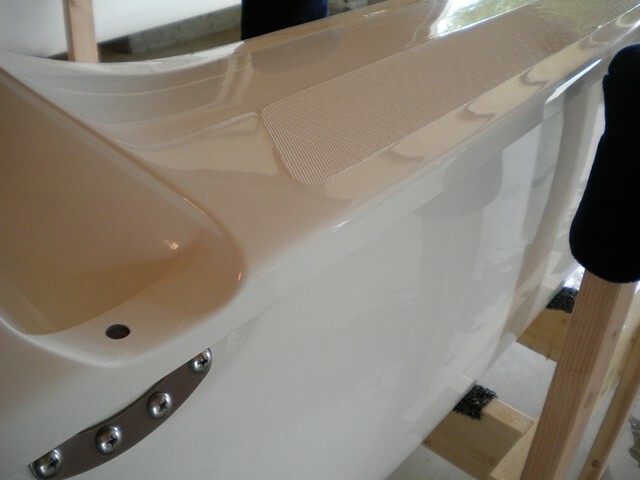 Final install will take place after the internal work is done, since there is a larger hole to work through right now. 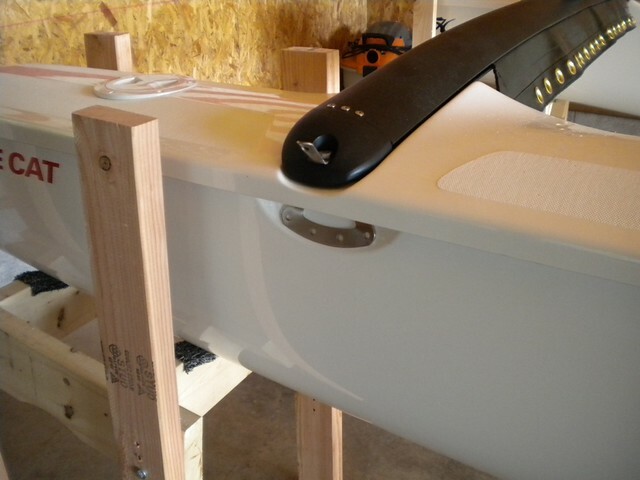 It has been a week since I have posted the current progress, since I wanted to post this section all at once: Daggerboards. I have spent a ridiculous amount of time (every spare moment of every waking hour?) working on this portion, but I am happy with the progress and results. Last week I received the set of new d-boards. 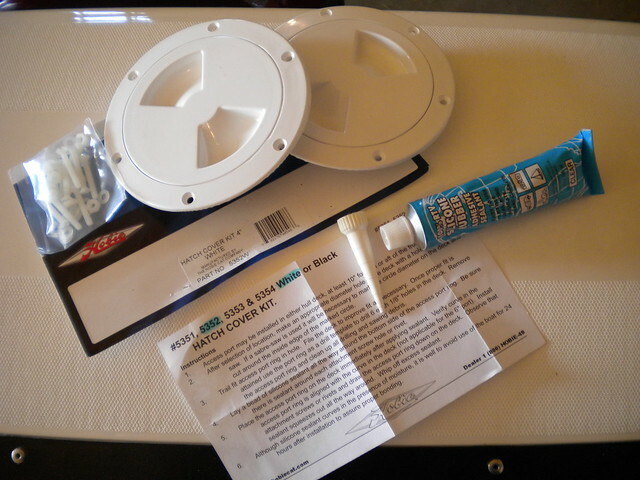 This was the second set, and very well packaged as shown by the blade on the right. The first set both sustained shipping damage (ouch!). Shipping these is not simple. Both blades arrived safely and securely. I was surprised by some edge roughness and scratches left over from trimming during molding and manufacture, and so I ended up spending an afternoon wet sanding those areas along the edge with 600 grit, followed by some buffing compound to remove the 600 grit haze. 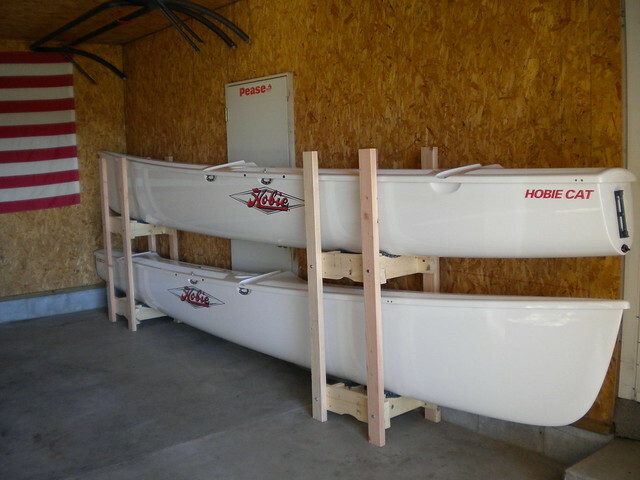 I added shock cords and hooks, and they are shown here with the Hobie board bag #82410001. It has a sturdy carry handle and a large velcro closure on one end. Should protect these well. 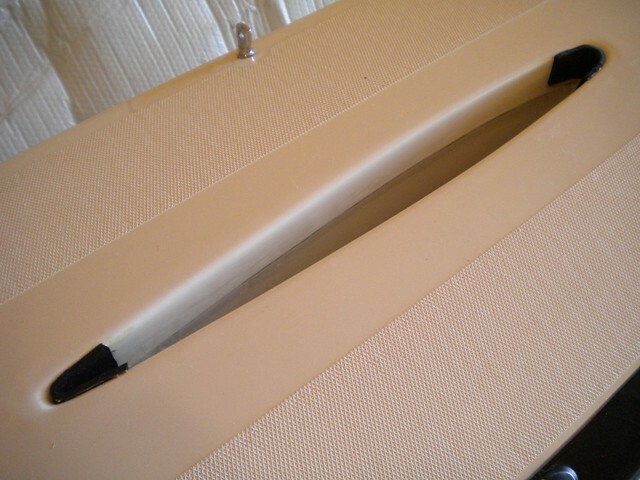 The storage case is really well made, and features an internal divider so that the boards do not rub on each other. First job was to remove it from each of the daggerwells. 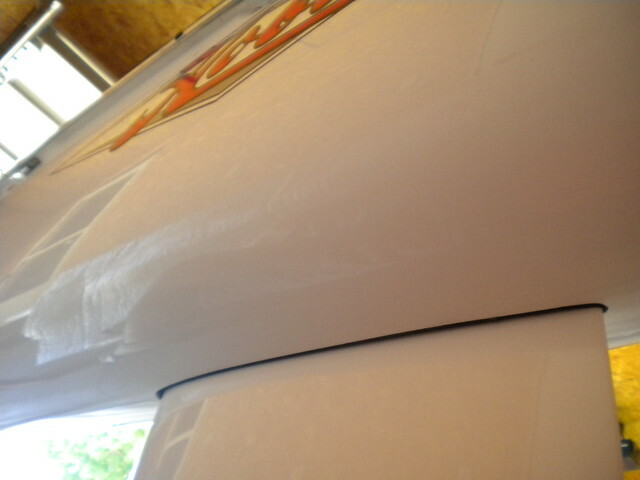 Tedious job as it is well adhered and I did not want to scratch the gelcote. 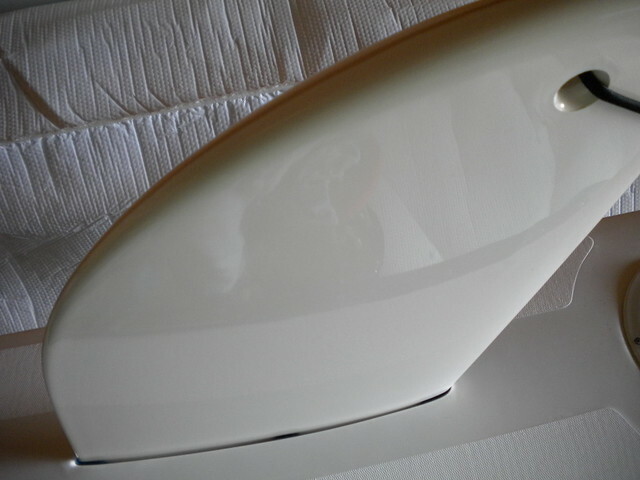 Additionally, there was a nasty lip / edge jutting out forward, down in the daggerwells, left over from molding the top deck of the hulls, that needed to be carefully filed smooth...it would have enjoyed taking sharp little bites out of the back of the daggerboard! In addition to replacing the front and back protection, I added a piece to each side in order to tighten up a bit of side to side slop. 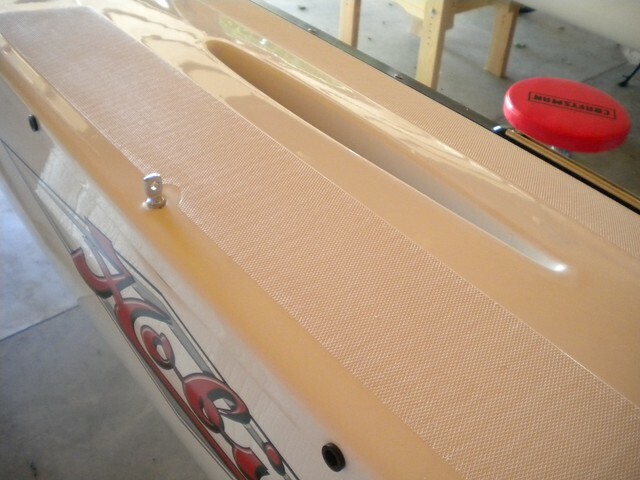 Next issue...looks like the daggerboard shock cord tie off points in the deck lips are missing! 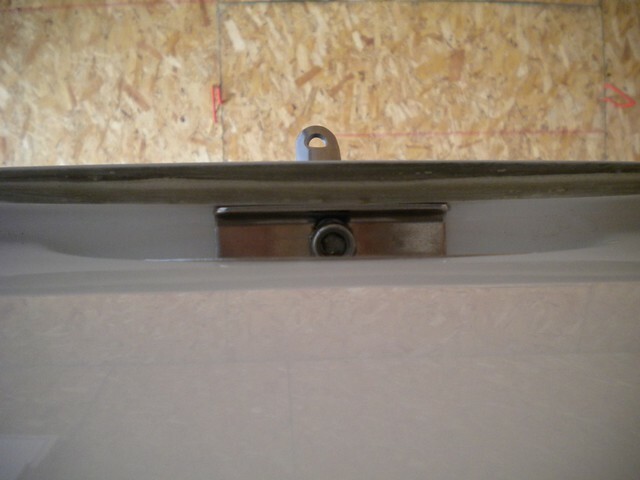 These are a hole drilled slightly forward of the front crossbar on each hull. Having bad visions of mis-drilling the hole (and sending a drill bit into the side of the hull), I chose to use a very small pilot bit for the initial hole...figuring it would give me more options for correction if something went wrong. Everything went perfectly, however. Here is a pilot viewed from underneath. 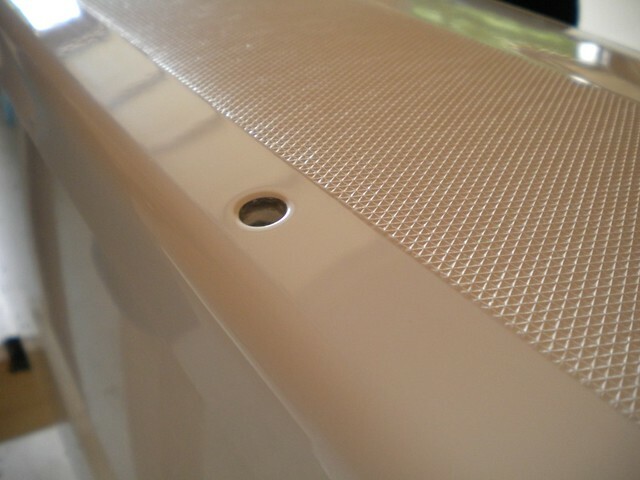 You can tell it is centered in the groove because the relection of the hole in the side of the hull is twice the actual viewable distance from the hole to the inside edge of the deck lip. 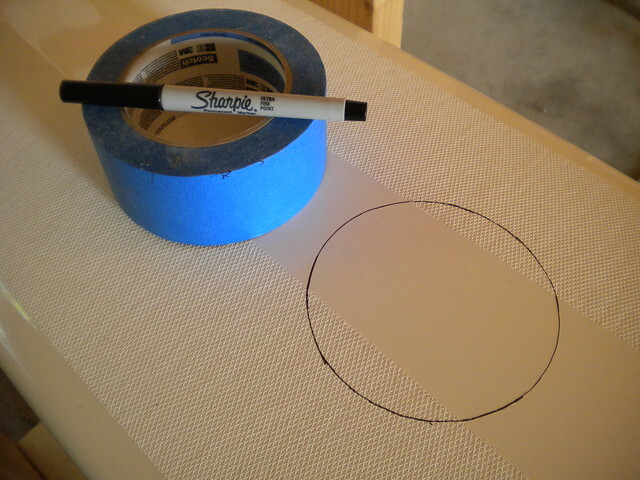 Next I enlarged the initial pilot holes to their final sizes with a series of stepped drills. These are an excellent tool for the job since they tend to follow the pilot well. 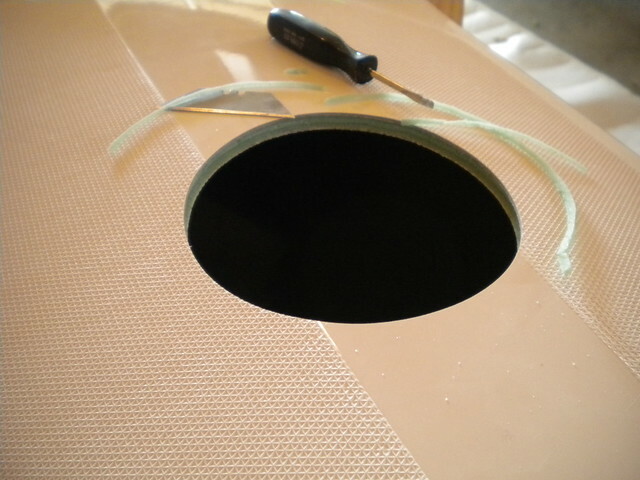 I tried a variety of things to do the radii at the top of the holes, but ended up just doing them carefully by hand with sandpaper in the end. Rope tie-offs for the shock cord hooks added. 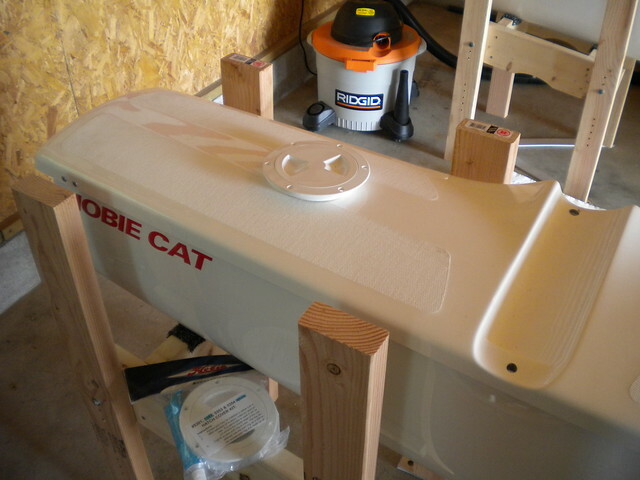 Makes install / removal of the boards fast. 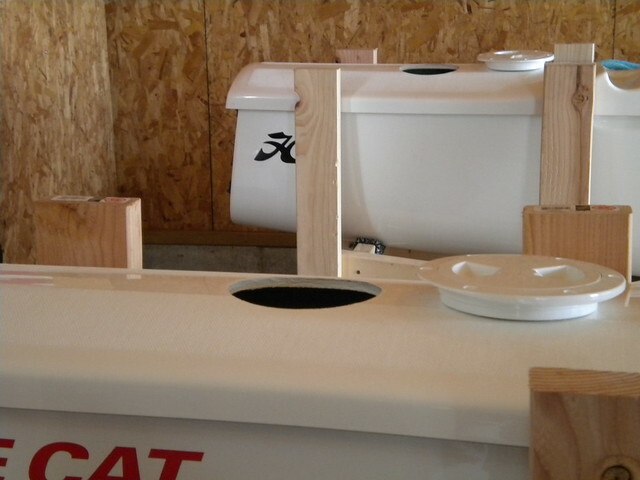 The fit of the boards is awesome, with moderate friction and a smooth sliding action on each daggerboard. 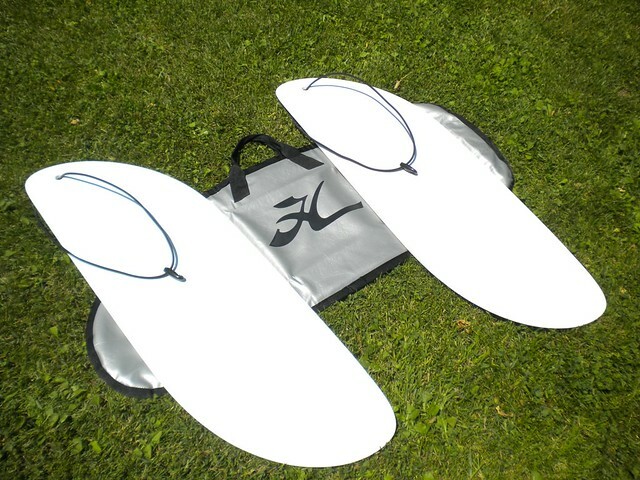 Underneath, the factory Hobie neoprene fit is fantastic on the boards...extremely happy with that! Looking beautiful. Glad you updated the post I was getting withdrawals. 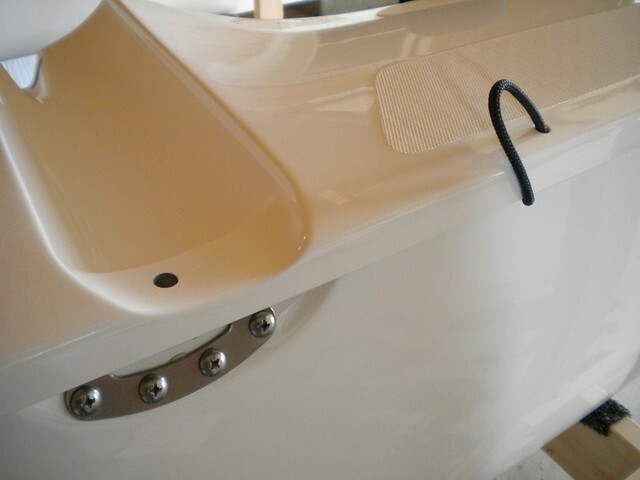 This boat is going to be fantastic. I'm loving this thread, the boat, and the info. Only problem is the boat is going to be too nice to sail! Great job, but don't miss the sailing season. Git-r-done! The other problem is all the tools/shop/product are way too new. . . Thanks for this post, fun to watch it all come together. 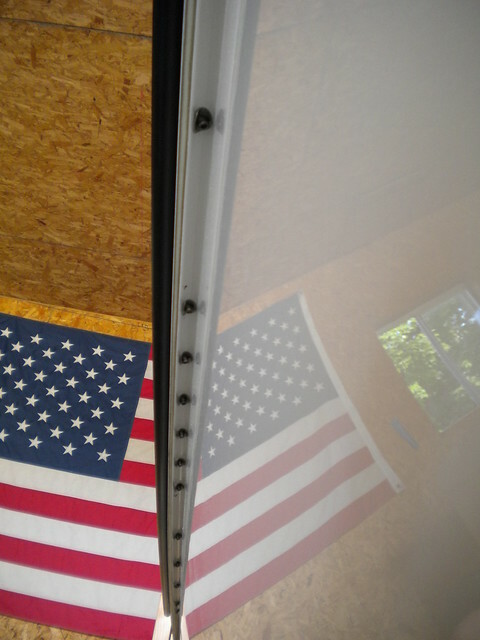 I was in my "loft" and just found a brand new set of red/white H-18 sails I didn't know I had... now I wish I had your hulls! Keep up the posts... I want to see the finished product! 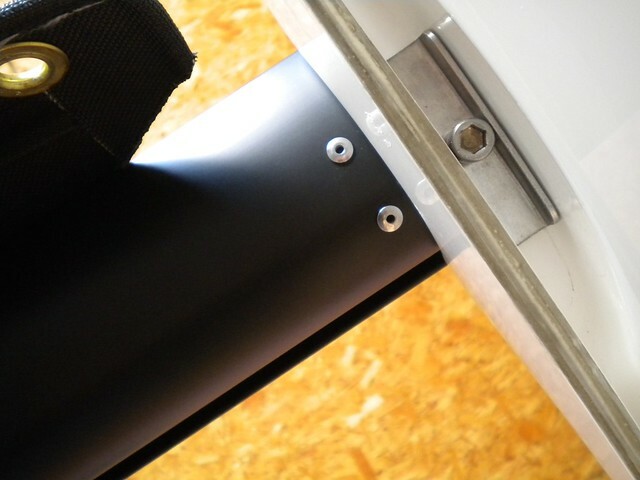 This portion of the construction ate up an enormous amount of time due to the number of bits and pieces that need to fit together correctly in order to ensure a solid, square catamaran once completed. Internal casting. 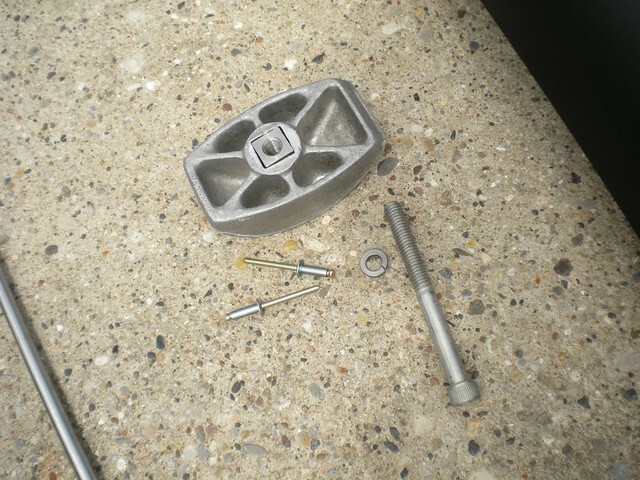 This is what each inboard crossbar bolt threads up into. 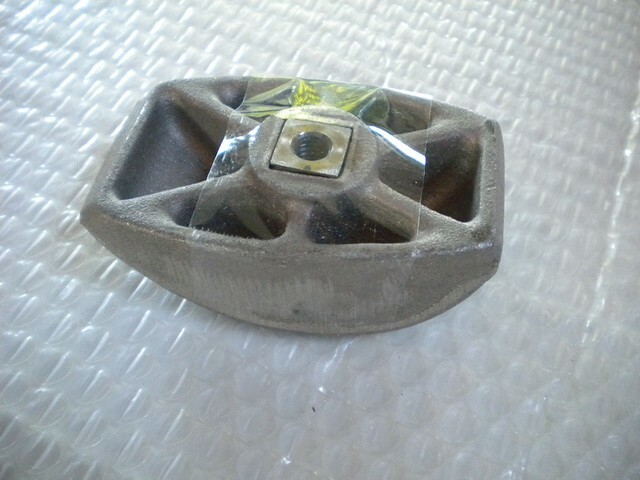 It is an aluminum casting with a threaded stainless steel insert. Boats older than the mid 1980's have a slightly different insert (essentially a nylock nut) that has roughly half the thread engagement. 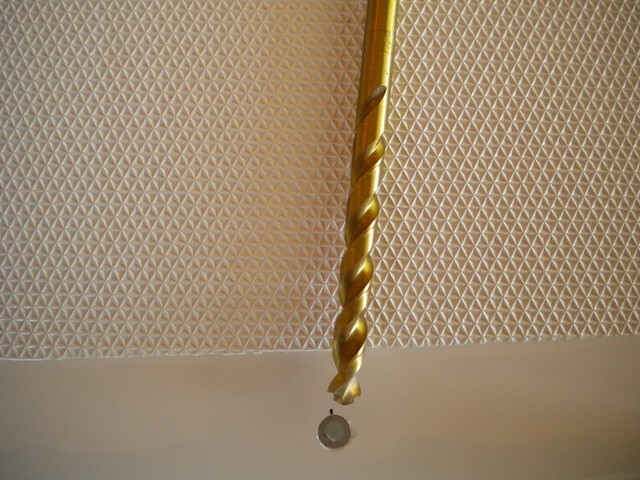 Striker post componants. 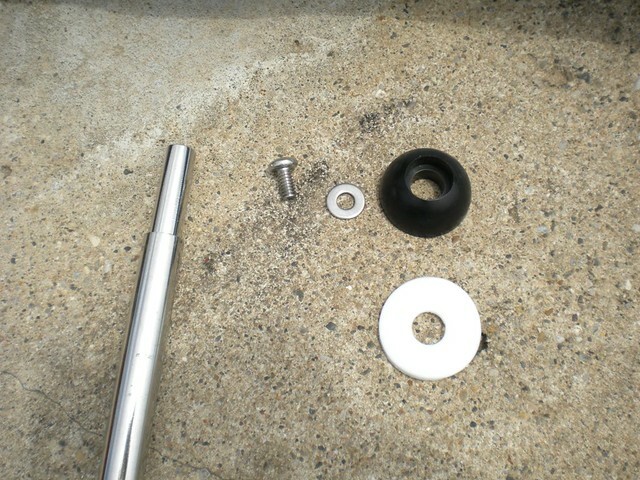 I am using an additional teflon disc (the white 'washer') under the black mast bearing to reduce / eliminate mast squeak. 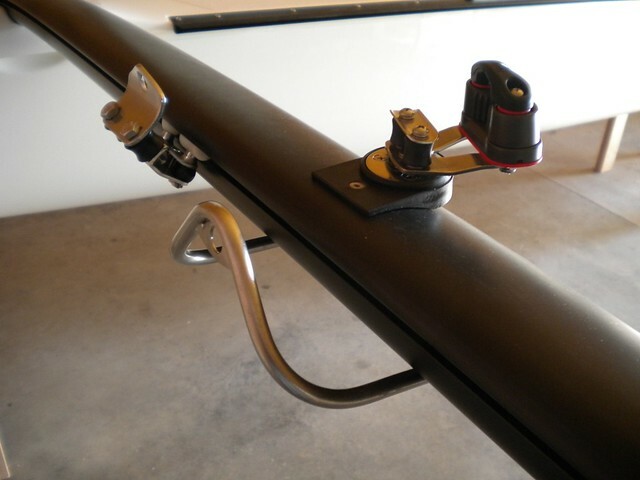 I am going to look into doing a top-mounted crossbar cleat assembly for the roller furling line. The standard Hobie 18 style isn't very user friendly. 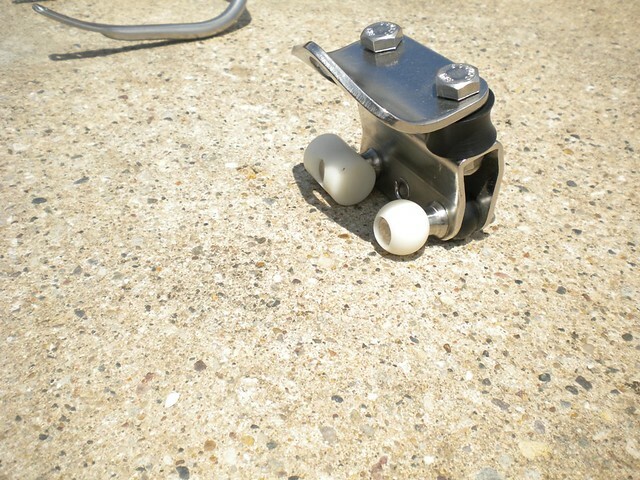 A swivel cam cleat would be perfect, but I couldn't find any that were truly low profile enough. Even a Lance cleat looks like it would be happy to remove some skin in the event of a pitchpole, so I am tentatively going forward with a micro-sized Ronstan cleat with a matching-sized Harken fairlead. Likely won't locate or install these until the final rigging process when the mast is up, in order to assess angles of the furling line and therefore correct placement of the cleat and fairlead. 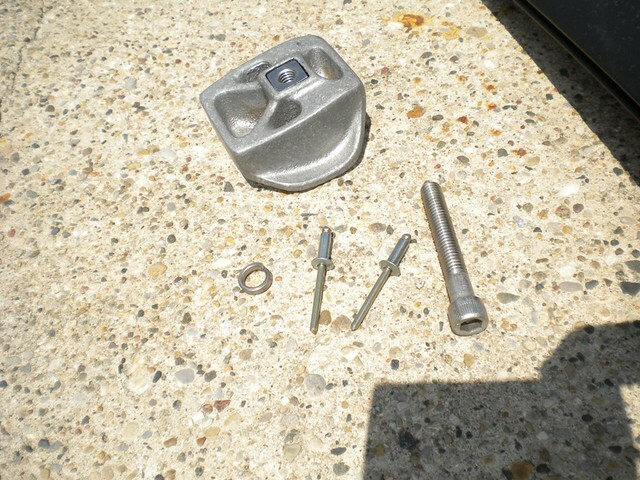 Rear internal castings. These are unique to the rear due to the differing front and rear crossbar extrusions. The standard traveler comes equipped from Hobie with two 'slugs', but many people including myself prefer the 'one ball, one slug' combination. I had a couple new sets laying around so I upgraded the traveler as shown. 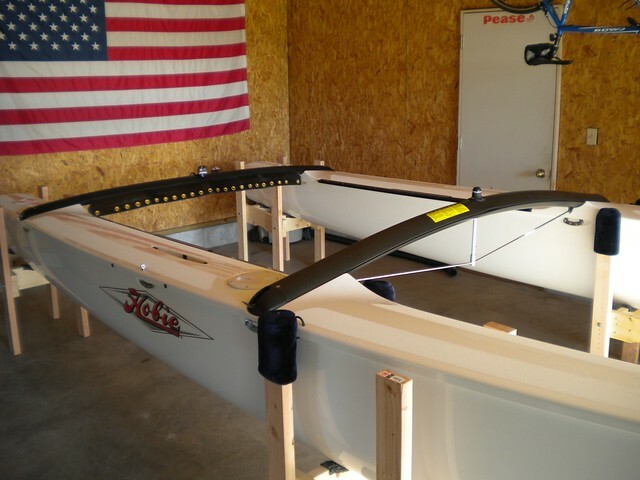 I don't believe that Hobie offers the ball option any longer, although they may still be available on the aftermarket. 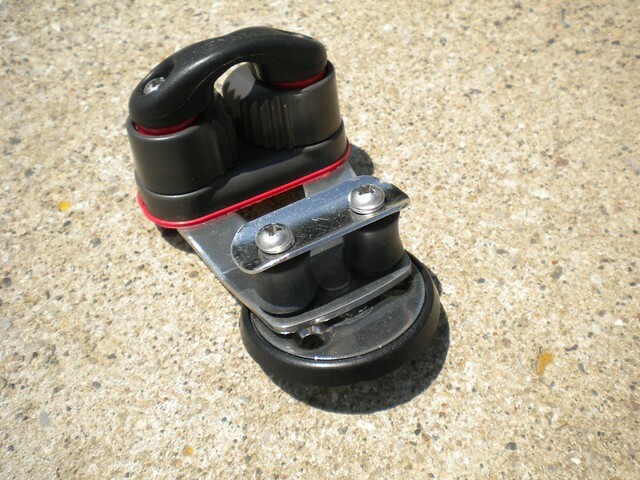 Traveler cleat assembly, all Harken. The Cammatic is upgraded to the aluminum style, which seem to have better life and grip on newer high-tech lines. 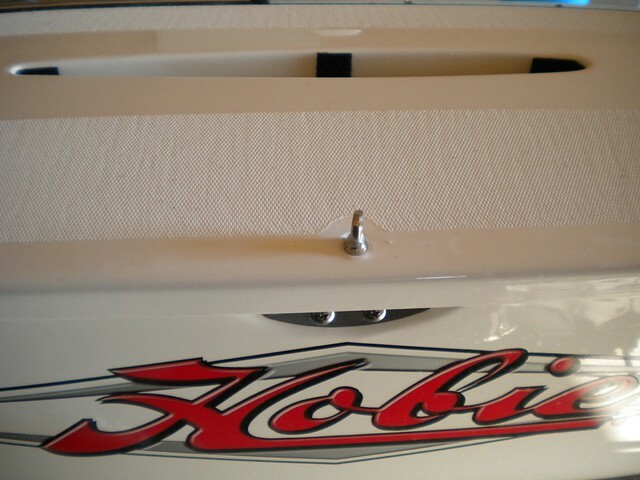 I added the Hobie Roller Fairlead Kit #50012 which is a nice feature and does noticably reduce line friction when adjusting the traveler. 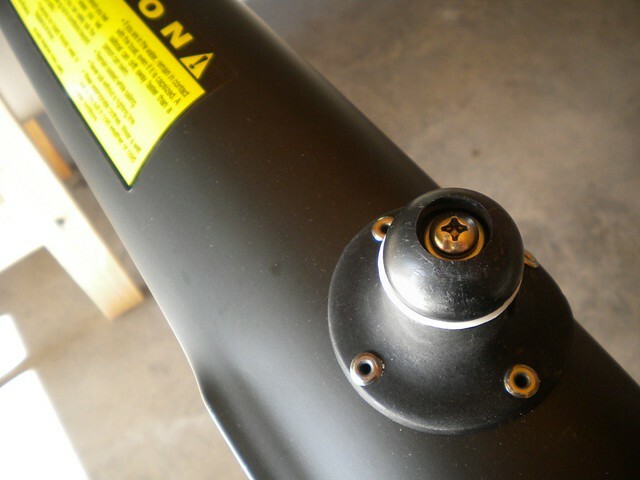 Before beginning crossbar assembly, I used the best anti-seize I had on the threads of the internal castings to protect from galling during assembly. I have also used lithium bearing grease before, but this stuff works much better, and has a higher viscosity than comercially branded anti-seize products. In addition to this, I placed a piece of packing tape over the top of each casting to keep dust and dirt out. Might aid in disassembly in the future if ever needed. 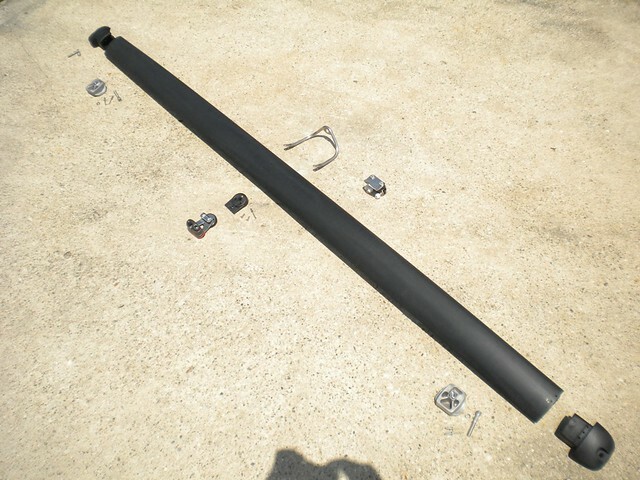 All crossbar assembling was done on a large piece of closed-cell packing foam. Really protects the parts from nicks and scratches during handling. 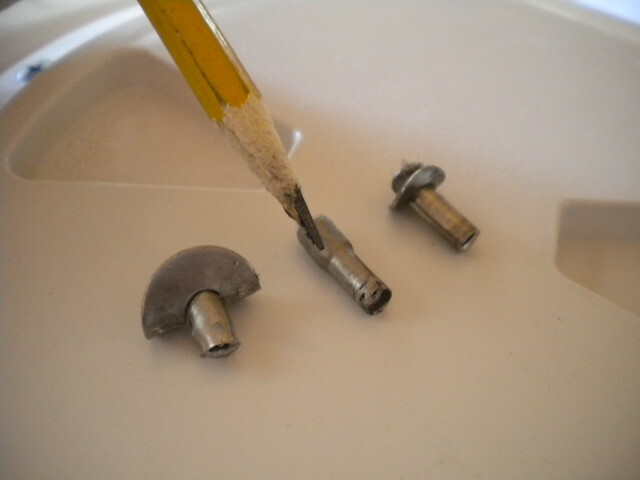 Used a dead-blow hammer for seating the end caps to prevent marring the castings. There was an unexpected amount of fitting required in order to mate the crossbars to the hulls, due to the hulls being manufactured with very thick deck lips, the thickest I have ever seen. Might be good for hull longevity, but ate up a lot of time and even required sourcing outboard bolts with longer threads due to the additional thickness. Not possible to actually see it in this photo, but I added two small stainless spacer washers underneath the stainless 'capture' washer in this assembly, ensuring that I could snug the stainless screw yet still have a free-spinning mast bearing. 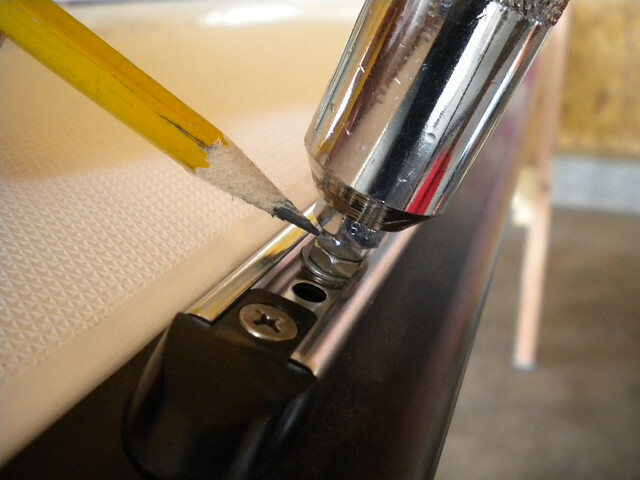 This is one of the few places that I also use Lock-tite, since this is a fairly important piece of the rigging. 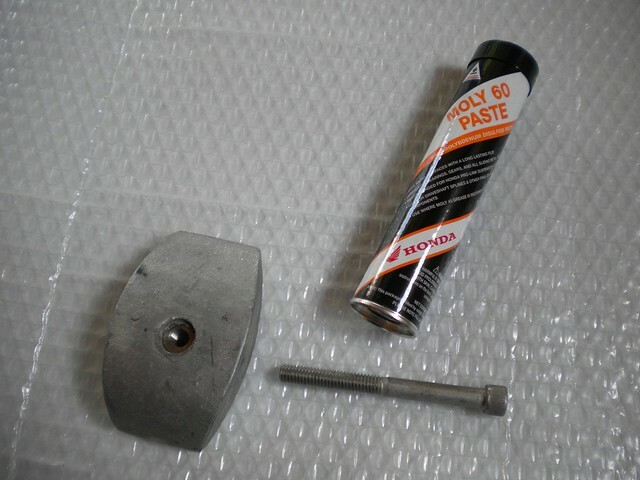 For reference purposes, this is what the 'new style' 4-rivet mast bases are...wider with more surface area in contact with the crossbar and 4 rivet fasteners from the factory. Rear crossbar...I went ahead and slipped the rear lacing strip into place before seating the second end cap...much easier job at that point! Close up. 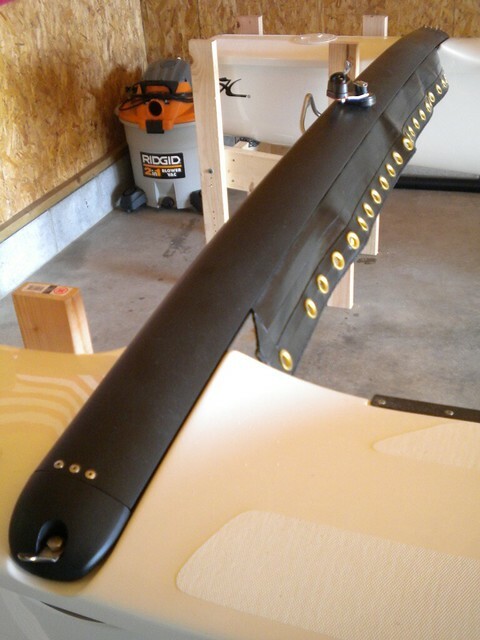 Wing tab for upcoming wing installation visible. Still need to finish installation of the shroud anchor plates (not bolted to the hulls yet) and then seat the rear deck ports. 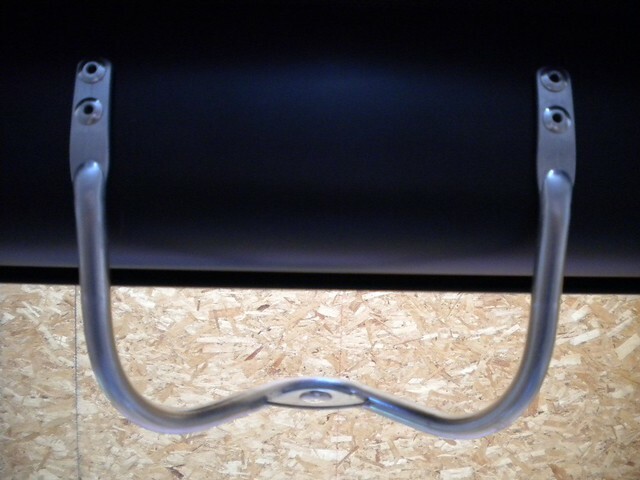 Crossbars loosely fitted. 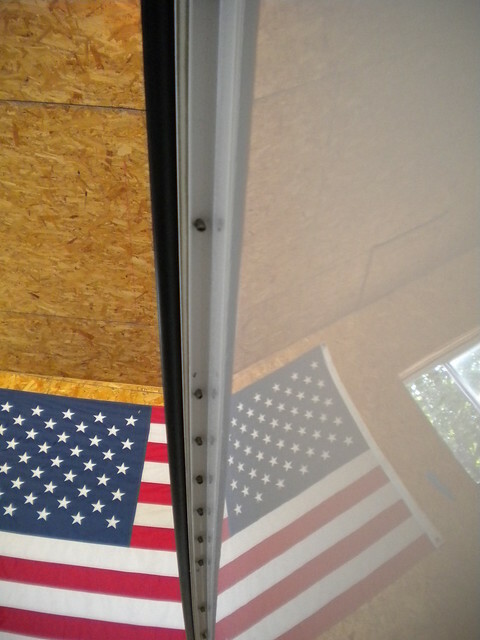 Will square up the hulls and tighten these down next, before beginning the trampoline install. GOODNESS that thing is gorgeous. Top Notch work so far! This looks AMAZING. Its awesome to see how an 18 would have looked new. Your one of the last, if not the last person who will ever get to put a completely new H18 together.